CTI tech support uses "AeroAdmin" software so we can provide quick, simple, and secure remote assistance to subscribers of CTI Navigator running in Windows. 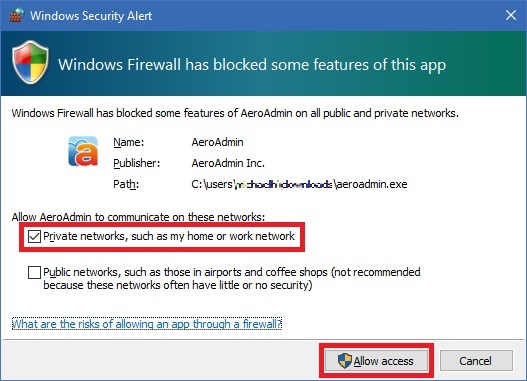 The AeroAdmin app does not need to be installed and does not require special privileges in Windows. 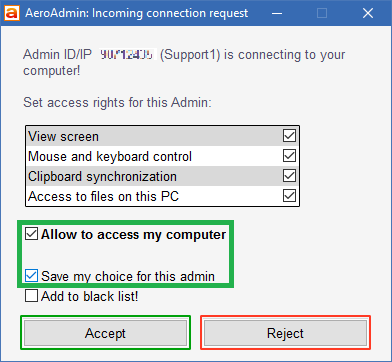 On "AeroAdmin Incoming Connection Request" screen, check "Allow to Access My Computer" then click the Accept button. This encrypted and password protected connection will allow a CTI technician to temporarily have full control of your computer over the Internet during the troubleshooting session. No installation and no other configuration is required. If you run this application as recommend by CTI, it will be automatically removed from your computer when the application is closed. Before using the AeroAdmin application, see CTI's Disclaimer of Warranty in note 1 below. Open any Internet browser in Windows (such as Internet Explorer, Chrome, Edge, Firefox, or Opera). Click this link (to go to http://900100.net/) and Run the AeroAdmin.exe file. (If your Save this file you scan it with your antivirus program before you Run it. In this case, CTI recommends that you delete the saved file after ending the support session with CTI). After reading and agreeing to CTI's disclaimer of warranty (see note 1 below), CTI customers can contact CTI Tech Support (phone 1-800-533-1031 or email ctiSupport@ctimls.com during normal weekday business hours) and request Remote Assistance. Give CTI "Your ID## ### ###" from the left side of your AeroAdmin screen . When a CTI Tech initiates a connection using the ID# you provide, a new "AeroAdmin: Incoming Connection Request" window may appear showing that "AeroAdmin: Incoming Connection Request". (See example image below.) Leave all "access rights" boxes checked, check "Allow to access my computer", and check "Save my choice for this admin." allow CTI to troubleshoot as necessary on your computer. Then click the Accept button. You can control and close an AeroAdmin remote connection at any time. To temporarily close the connection, click the Stop button on the AeroAdmin connection screen. This will leave the application open and ready to start another connection (when you click the Start button and tell CTI to re-connect). You also can click Connect in the top left corner of the AeroAdmin screen and select "Close All Connections." To completely end the session and close AeroAdmin, click the standard Windows X (Close) button in the top right corner of the AeroAdmin connection screen. Unless the connection is lost before we can do so, the CTI Tech will normally end AeroAdmin and close the support connection as soon as the remote support session is completed. AeroAdmin is not installed, so it does not appear in your Windows list of programs. It only runs a temporary Internet connection application. If you ran (and did not save) this application file (which is recommended), it will be automatically removed from your computer when the application is closed. If you saved this application file but do not expect to need further remote technical support in the near future from CTI after this session ends, you should delete the AeroAdmin file from wherever you saved the file (your desktop or download folder). Deleting the application file will completely remove the application from your computer (see note 3). Note 1: Disclaimer of Warranty. All services are provided under the terms and conditions of CTI's license agreement accompanying CTI Navigator®. Assistance in any form is provided only as a convenience to licensed users of CTI products. Problems and solutions may depend on the nature of your system environment and other parameters that are unknown to CTI. By requesting assistance, user agrees that actions and solutions described, suggested or implemented by CTI staff are ENTIRELY AT THE USER'S OWN RISK AND ARE PROVIDED WITHOUT WARRANTIES OF ANY KIND. Under no circumstances, including negligence, shall CTI or any of its employees be liable for any direct, indirect, incidental, special, punitive, consequential or other damages, loss, cost or liability whatsoever that result from or are related to use of technical support provided by CTI. Note 2: Security. 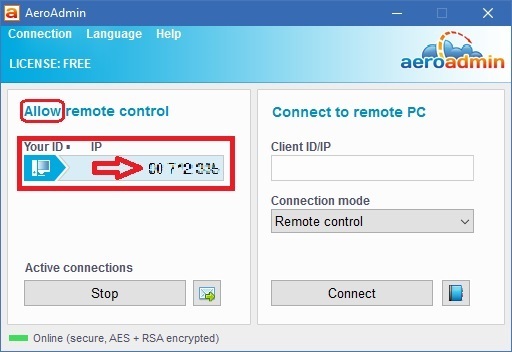 The AeroAdmin remote desktop application uses "an advanced hybrid (AES+RSA) encryption algorithm (click here for details)" to ensure privacy during transmissions over the Internet. The encryption mode is always on. When the AeroAdmin application is connected to CTI, no one else can connect to your computer using this application without your knowledge and permission. Security Warning: Do not accept help from any unknown callers or allow any unsolicited person or company to connect to your computer. Because AeroAdmin is free and so easy to use, it can be misused by unscrupulous persons. Microsoft and your Internet Provider (ISP) will not call you to offer unsolicited connections to your computer (and then charge you for this service). Note 3: Auto-reconnect Service. There is an optional reconnection "service" component of AeroAdmin that the CTI technician may need to temporarily install during troubleshooting to allow a CTI tech to remotely restart your computer and automatically reconnect. This is sometimes necessary to clear corrupted temporary files, or to test the effects of changing security settings, firewalls, or Windows User Account Controls. Once CTI has completed troubleshooting and corrective actions, the CTI tech will remove the optional auto-reconnection service if it was installed. This service can be removed only inside AeroAdmin. You can verify that this auto-reconnect service has been removed (if it was ever installed), or you can remove it or control it yourself by running AeroAdmin, then click "Connection" in the top left menu, and select Service. If the service is not installed, only "Install" will be available (in bold). If the service is installed and active, you can click "Remove" to permanently remove it (or click "Stop" to temporarily pause it from running). To go directly to CTI's menu of Error Fixes, click here.